Amelle Berrabah, Heidi Range and Keisha Buchanan of Sugababes all looked stunning in their floor length gowns for this event in London last week. These girls really made an effort to stand out on the red carpet. Together they look good, individually, amazing. Amelle wore a red plunge-neck dress by Jovani. Heidi wore black plunge-neck Halston Fall 2008 gown, and Keisha wore a strapless sweetheart necklined Ashley Isham Fall 2008 pine green gown. Dannii Minogue wore a very interesting asymmetric black dress, which has a peplum. She teamed her dress with a gold clutch, and a pair black and white shoes, which remind me of Gwyneth Paltrow’s booties. Fearne Cotton arrived wearing a plunge-neck black jumpsuit, with her hair swept to one side. The host of this event also changed into the mini sparkly number, which is much more her style. Melanie Brown wore an paillette covered halter neck gown from Jenny Packham’s Fall 2008 collection. The hairstyle does not quite work with the dress, but she has been working hard on looking glamorous and not trashy lately, so I will let it slide on this occasion. Myleene Klass shows of her curves with a figure-hugging strapless Jonathan Saunders Fall 2008 strapless column dress. Alesha Dixon won Ultimate Confidence Award, and she took to the pink carpet wearing a strapless sparkly mini dress, with a bow detail. 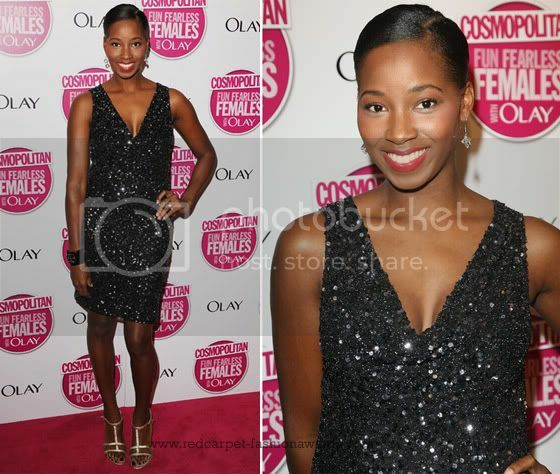 Jamelia stick to her usual boring style of LBD and slicked back hair. Kim Cattrall adds a bit of international glamour wearing satin black dress with Pierre Hardy heels.